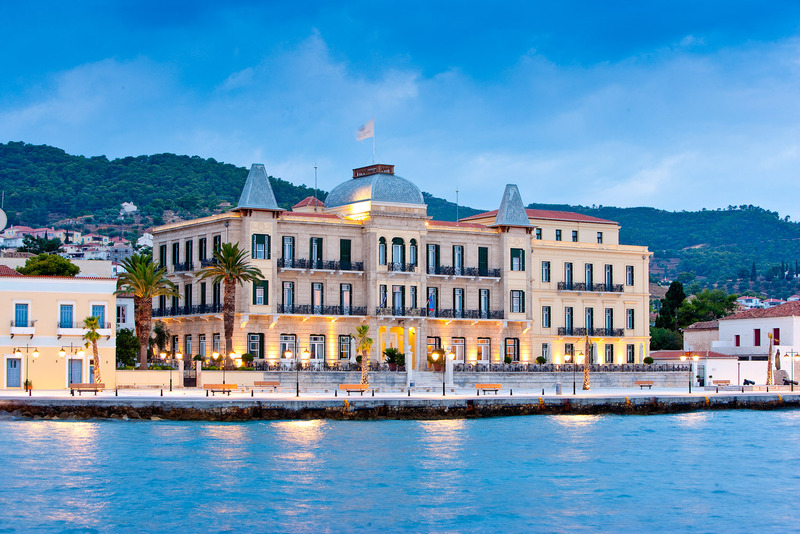 The architecture of Poseidonion Grand Hotel is reminiscent of southern France. The Greek island of Spetses has long been a secret haven for the jet set, but the revival of the historic Poseidonion Grand Hotel has people talking, and rightly so. Words by Despina Meris. Upon my arrival in Spetses, I wonder if I didn’t get the memo. Everywhere, women are sporting white embroidered kaftans and silver cuffs, set against deeply tanned olive skin, their voluminous proportions billowing in the breeze like extras in a Beyoncé video. The tourist uniform is a reflection of the island’s understated glamour. Its visitors are so well-heeled, there is no need for the showy excess of other islands – that is left to Mykonos. Instead there is a subtle affluence in the mansions restored to their former glory, sophisticated boutiques that whisper rather than scream, and the clip-clop of horses pulling carriages along the promenade. Just one nautical mile off the Greek mainland, Spetses amassed tremendous fortunes when its expert shipbuilders played a pivotal role in the British naval blockade during the Napoleonic Wars in the early 1800s. The island is etched with relics of its naval heritage. Old cannons line the new port of Dapia, while the charming old port has functioning building yards for wooden ships passed down from generation to generation. Local heroine Laskarina Bouboulina used her private wealth and naval skills to help Greece achieve independence from the Ottomans. Her museum is housed in the family’s mansion where her descendants still live. During the island’s glory days, The Poseidonion Grand Hotel became the holiday playground for high society, royalty and wealthy Athenians. Its palatial façade dominates the waterfront in a style of architecture echoing the French Riviera. The front entry gives way to crisp white arches, a marble staircase with cast iron handrail, timeless furniture in contrasting tones of white and dark wood, and cool mosaic tiles that offer respite from the heat. Airy high-ceilinged rooms open up off the foyer: an elegant sitting room displays a vast book collection and piano, and beyond is the cosy bar, lined with bookshelves holding tomes and martini glasses. The feel throughout is fresh and updated, without a hint of stuffiness. There is no domineering front desk, the welcoming staff greet us by name and quickly proffer chilled washcloths, the traditional liquor and freshly squeezed orange juice. We arrive early and are graciously offered the use of spa showers and change rooms so that we can relax by the pool while our room is prepared. Our holiday begins now. The spa is set amongst a Mediterranean-style courtyard with aqua-tiled pool, bordered by manicured olive trees and a few artfully placed palms. In such gracious surrounds it seems only natural to be treated to a gold leaf facial or a chocolate scrub. The understated elegance continues in our room. A white and grey palette unites classic furnishings and plush fabrics. There is more than just a nod to the hotel’s past: plantation shutters, a pedestal basin and clawfoot bath are just divine. As is the balcony that opens up onto the scene in the town square below; couples going for their early evening walk, children riding their bikes and glittering super yachts in the Gulf beyond. Special touches likely earned The Poseidonion its 2012 award for Best Classic Boutique Hotel in the World: an all-knowing concierge, traditional Spetsiot almond sweets on the bedside table, fresh produce from the organic veggie patch and their very own chickens for fresh eggs. The dining establishments all feature menus by celebrity chef Christoforos Peskias. Breakfast is a feast of lovingly prepared local products including crusty breads, chunky fruit-filled jams, cakes, traditional rice puddings. Meanwhile, The Verandah, which graces the length of the hotel’s front façade and the square, is the place to be seen. Beside the incredible food, the cocktails are perfectly concocted and the passionfruit mojito quickly becomes a favourite. Visit in September during the Armata Festival, a celebration of Greece’s liberation from the Ottomans, which culminates in the reenactment of the burning of an Ottoman ship before the harbour is lit up by fireworks. But whenever you decide to go, don’t forget your white kaftan. From $289 for a Deluxe Garden View; from $339 for a Deluxe Sea View.